Purchase vinyl siding as thin as .040" and expect decent durability from the products. But if you're buying woodgrain vinyl siding and want it to look authentic, a thicker product, from .044" to .075" will serve you better. Wood planks have a grain pattern you can almost feel. Vinyl siding manufacturers weigh that grainy feeling against the product's strength and impact resistance. The thicker the siding, the deeper the castings from real wood can be. Added thickness gives clapboard, Dutch lap, and board-and-batten styles a truly authentic look. Knots and a slightly weathered look extend the feeling, especially for natural colors. Wood shingles and shakes have noticeable hand-sawn or hand-split textures, respectively. Irregular shadow pattern cast by shingle or shake siding increases their rustic charm. Woodgrain vinyl shingles and shakes are often thicker products. Unlike wood shakes, vinyl shakes have one completely flat side for a weather-tight installation. Shingles come in many decorative shapes and several dozen colors resembling transparent or semi-transparent stains. Vinyl log siding usually resembles debarked half-logs. The grain is deep and may have the variation of color typical of light weathering. Color choices are limited but authentic. Thicker vinyl plank styles are more rigid than thinner ones to eliminate warping and increase impact-resistance. 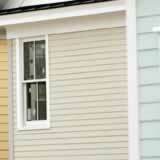 Vinyl shingle and shake siding, like vinyl planks, come in 12 foot long sections two rows high. This permits faster installation than wood shingles and shakes. Interlocking courses create a seal more impervious to wind and moisture than their piece-by-piece wooden counterparts. Vinyl logs' half-round cavities are filled with insulation for rigidity and energy savings. They also have interlocking flanges for weather-tightness far superior to actual logs. The ease and cost of installation far exceeds wood logs--they're even suitable for homeowner installation. Beautiful. Easy. Durable. Choose vinyl siding.